Row, row, row your boat with your whole family-even your pet can don his sea legs and join in on the fun! You're the kind of crew that sticks together. Showcase this and your unique clan with Patricia Carlin's charming personalized artwork. 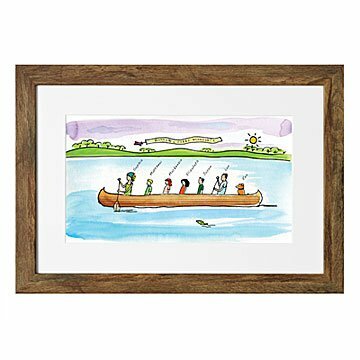 A colorful cast of characters custom designed to look like your family paddles along in a cozy canoe built for 2-14. Choose hair and skin color to match your water-bound group even your family pet can don his sea legs and join you on the water. Designed in Pennsylvania. Printed and framed in Oregon. For more family scenes, check out our Personalized Family Tandem Bike Art and Personalized Family Ski Art. Perfect in our home! Awesome quality and unique. Everyone comments on it and wants one when they see it! I turned out to be a beautiful picture; even nicer than I imagined it would be. I plan to definitely use your website for future purchases. It took a little longer than I anticipated, but it came out perfect! My parents loved it and hung it where everyone can see it. We get compliments all the time about it, as well as people asking where they can get one too. This was a unique anniversary gift incorporating our whole family in my husband' favorite pastime. I was looking for a fun, unique gift in honor of their 10th anniversary and this print was perfect. They have 3 beautiful children and 2 pets - all included in this print! As a family they love to canoe when they vacation in Rhode Island! Perfect! The grandparents have taken all their grandchildren (and now great grandchildren) canoeing over the years. They are now aged between 31 and 14 month old. This picture was to reflect how super the years have been being a family having fun together. What do you get someone who has everything?! My parents can be extremely difficult to shop for, but this was the perfect Christmas gift. Some of our best family memories have been made at their Summer lake house in Maine, where we always take a canoe trip down the Saco river. This gift was personalized, thoughtful, of good quality and they absolutely loved it! I think my Dad may have even secretly shed a tear! Christmas gift that is sure to last. Glad it was framed - made it simple to go right on the wall! I could review proofs to make sure I liked it and the artist was very quick with changes. My family recieved this as gift. Absolutely beautiful! We have it hanging in our kitchen. It brings a smile to each one of us everyday. Best gift ever.